Condition: The sheet is in a clean condition with a closed tear at the top edge. This issue has been addressed by the whole sheet having been laid upon a conservator’s support sheet. 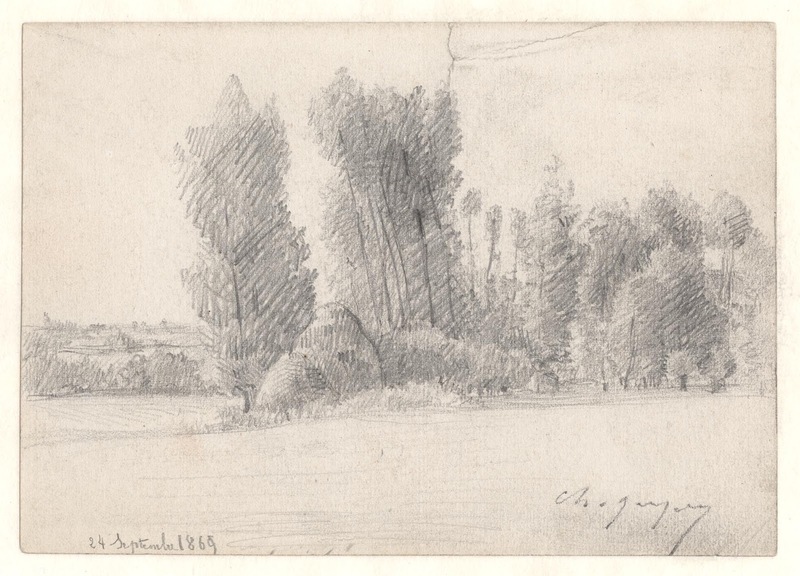 I am selling small original pencil drawing by Charles Jacque—a seminal and key artist of the Barbizon School—for the total cost of AU$212 (currently US$168.28/EUR143/GBP130.70 at the time of posting this listing) including postage and handling to anywhere in the world. 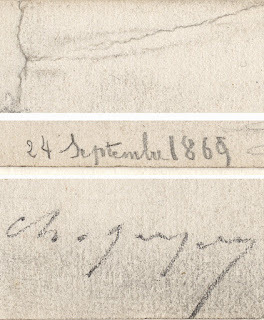 If you are interested in purchasing this exceptionally rare signed and dated study by the hand of one of the great French masters, please contact me (oz_jim@printsandprinciples.com) and I will send you a PayPal invoice to make the payment easy. This drawing is very small—a genuine sketchbook size piece of paper—that I can easily imagine was taken out into the field by one of the most famous of the French artists of the 19th century, most notably as one of the key figures in the Barbizon School of artists: Charles Emile Jacque. 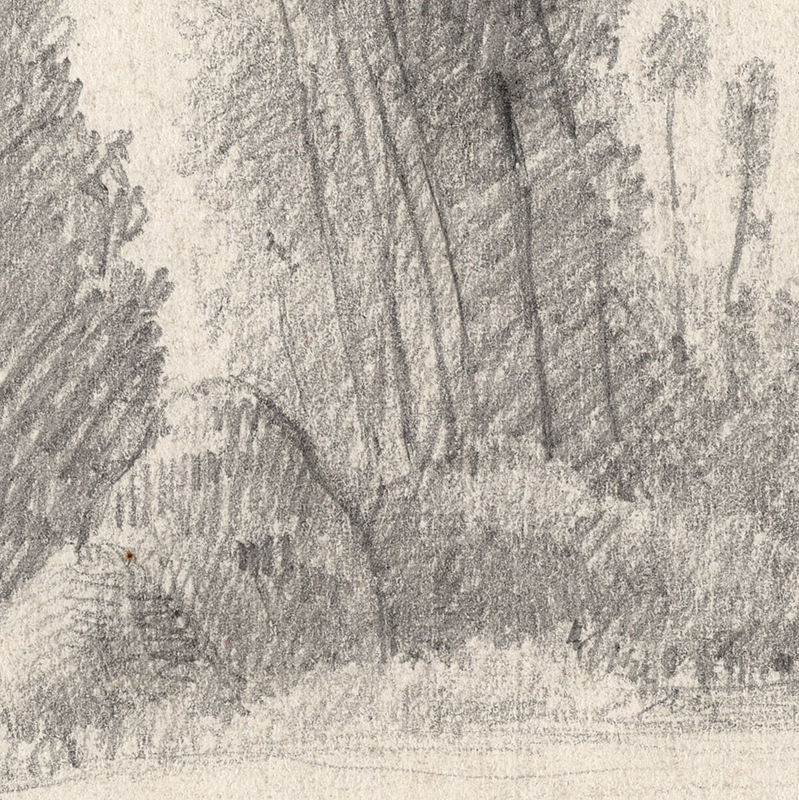 When looking at a drawing like this I can to a limited extent construct the spirit of the man who made it. Of course I may be VERY wrong in the assessments that follow but at least I’ve laid out what I have pieced together. Assessment 1: Jacque was right-handed and he executed this drawing the “right” way around (i.e. he didn’t work on it at any stage by turning the sheet to one side or upside down). My opinion that he is right-handed is based solely on the angle of the return strokes or zigzag lines tilting to the right. I also feel certain that the entire drawing was “done” with the top of the page always in the same position, because there is a downward pressure in the phrasing of the strokes. Assessment 2: Jacque was a humble man and not given to being a controlling person. This personality trait is reflected in the fact that he has not underlined his signature—a hallmark of an overly confident person or narcissist—or added a full-stop after his signature—an arguable hallmark of person liable to be controlling. 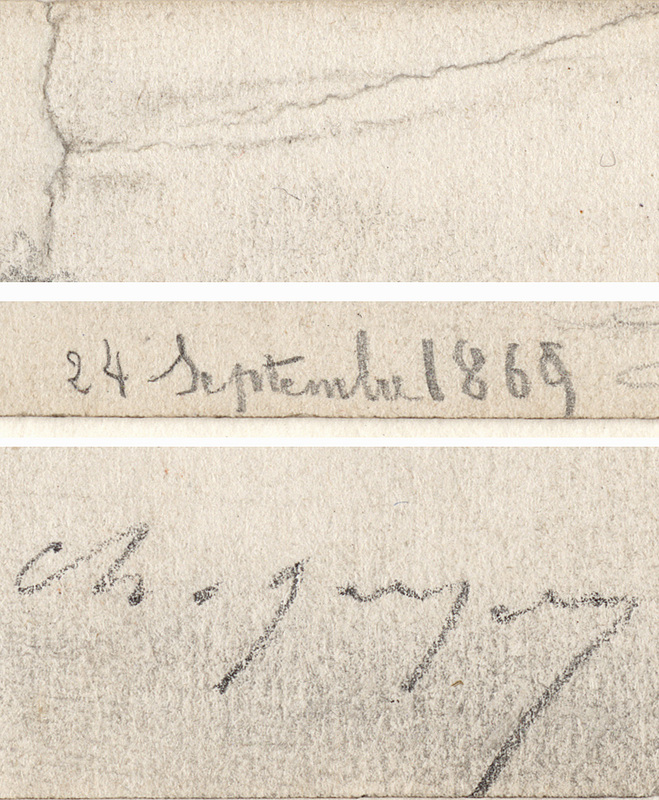 The extraordinary length of the “J” and “y” in the signature suggests to me that he wished to be more than he is (i.e. the length of these letters may indicate that he is creating a facade to hide his true identity). Assessment 3: Jacque was an introvert. My reason to suggest this is based on the composition. What I mean by this is that introverted people tend to create pictorial barriers in their artworks designed to hinder viewers from conceptually “entering into” the pictorial depth of a scene. 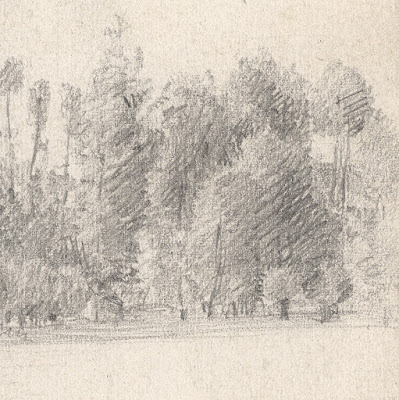 In this drawing such a pictorial barrier exists in the middle distance where Jacque has employed a screen of trees to create a partial barrier. Assessment 4: Jacque was an emotionally balanced chap. I suspect that this is true as he has created an even proportional balance between the areas in the drawing that are heavily worked upon and areas where there is no line-work at all. Assessment 5: This is a study is made from direct observation in the field. Although the line work carries all the attributes of a quick sketch made out in the field (perhaps near Écouen? ), there is a secret to its execution that helps to confirm this: there are no figures or animals. I mention this shortfall as Nancy Mowll Mathews (1994), in “Mary Cassatt: A Life”, describes Mary Cassatt’s shock, horror and dismay when she discovered: “… that they [viz. 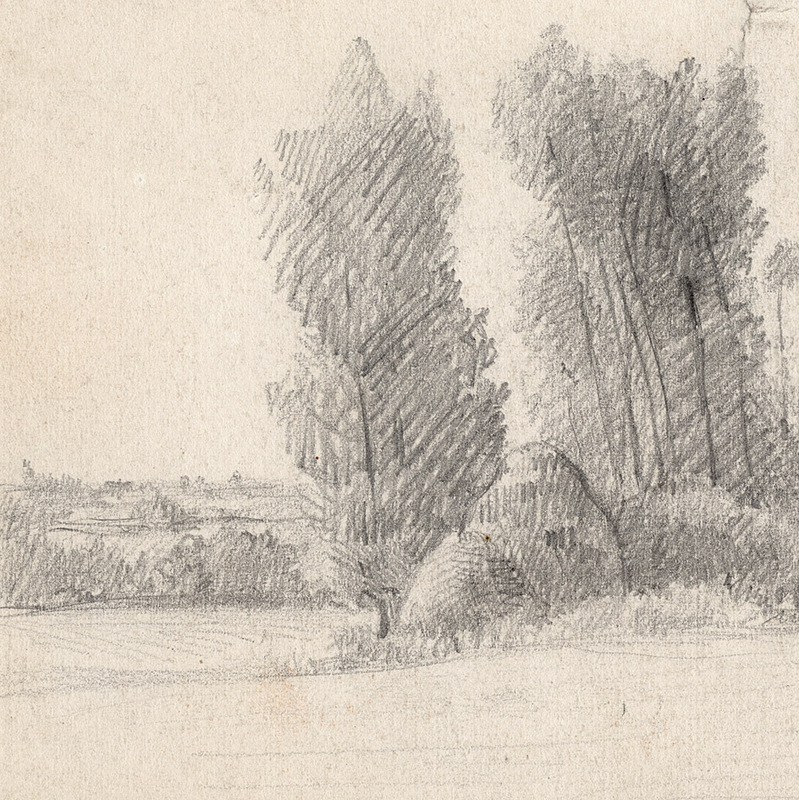 Troyen, Breton, Millet, Rousseau, Corot and Jacque] neglected the figures in their composition—in fact, did not draw them from life” (p. 46).